THE TOTAL VALUE OF ECONOMIC ACTIVITY RELATED TO US PORTS IS $4.6 TRILLION: That represents 26 percent of the US economy, projected to reach 60 percent by 2030. The health of US port infrastructure has a nationwide impact. Port activity supports 23 million US jobs. Port activity generates $321 billion in tax revenue each year. The American Association of Port Authorities (AAPA) HAS announced the launch of a campaign that will advocate for transportation infrastructure investment on behalf of the nation’s manufacturers, farmers and other workers who count on modern and efficient seaports to move American products to overseas markets. Called the America: Keep It Moving campaign, AAPA’s US members in the coming months will coordinate actions to inform policymakers, and those who influence policy, about the job-creating power of US ports as the Trump Administration and Congress consider plans for national infrastructure improvements and funding. The health of US port infrastructure affects not only coastal, Great Lakes, and river communities, but has a nationwide impact. Port activity supports 23 million American jobs and generates $321 billion in federal, state and local tax revenue each year. According to a 2015 Martin Associates report, the total value of economic activity related to America’s ports is $4.6 trillion, representing 26 percent of the US economy – and projected to reach 60 percent by 2030. The US Chamber of Commerce notes that one of every of three acres on US farmland is planted for export markets, and nearly 12 million jobs are supported by exports nationwide, including a quarter of all manufacturing jobs. Infrastructure investment impacts how efficiently US goods are transported to port facilities for export. Among the highways that take US goods to market, 1,200 miles of the nation’s road, bridges and tunnels serve as vital freight connections to ports, much of which is in dire need of investment. According to the American Society of Civil Engineers, the cost of deficient highways could cost US businesses and households up to $575 billion to by 2025, reaching a $3.2 trillion loss by 2040. The volume of freight in the US is projected to grow more than 40 percent by 2045, while the value of that same freight is projected to increase about 92 percent, according to the US Department of Transportation. By 2037, the US will export more than 52 million shipping containers through US seaports each year. 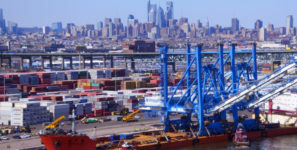 To meet the growing demand, AAPA is working to make seaports a key priority for policymakers considering plans for investment in US infrastructure, and is advocating increasing investments in Department of Transportation programs that target seaport infrastructure; full funding for the US Army Corps of Engineers Coastal Navigation program; adequate staffing and resources for Customs and Border Protection and the US Coast Guard; and federal investments that help ports reduce the environmental impact of freight transportation.